launch them towards the target. boat history, Simon Fraser, and both Scotland and China. and sharing, and surprises was equally expressed. This entry was posted in Main Page, SFU Gung Haggis Fat Choy "Canadian Games" on January 26, 2007 by Todd. What happens when you unleash the Gung Haggis Fat Choy concept on university students? their team uniform. Here they are poised for a quick start. population together with the university's Scottish traditions. Voila – SFU Gung Haggis Fat Choy “Canadian Games” was created! And Dragon Cart racing was born! I will be MC for the ceremonies, and the play by play announcer for the Dragon Cart races. exciting day of competition on Burnaby Mountain. there will be lots to see and do up on the hill. different take on the traditional highland games. Full event schedule and team registration details attached. NOTE: There will be other displays, performances and activities happening throughout the day, between main events! Specify morning or afternoon dragon cart races. This entry was posted in Main Page, SFU Gung Haggis Fat Choy "Canadian Games" on January 23, 2007 by Todd. in action on page B1 on today's (Jan 29) Vancouver Sun. crutches and much enthusiasm in a race down Convocation Mall. CITY TV and Channel M also shot camera footage – I missed it on last night's news – did anybody see it? please comment! This entry was posted in Main Page, SFU Gung Haggis Fat Choy "Canadian Games" on January 29, 2005 by Todd. original teak dragon boats donated to Vancouver during Expo 86.
a boats hull. They will seat 6 paddlers + steersperson. build heads and tails – they will be beautiful! participate in both fun and physical exercise oriented activities. This entry was posted in Main Page, SFU Gung Haggis Fat Choy "Canadian Games" on January 27, 2005 by Todd. January 30th, 2005, at Floata Restaurant in Vancouver's Chinatown. 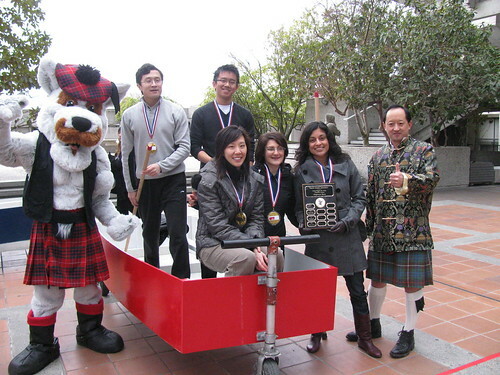 We need help naming our Dragoncarts for the First Annual Gung Haggis Fat Choy Canadian Games. Read more to find out details on this exciting contest or check out the whole event. Fat Choy Canadian Games is the chance to name the Dragoncarts. 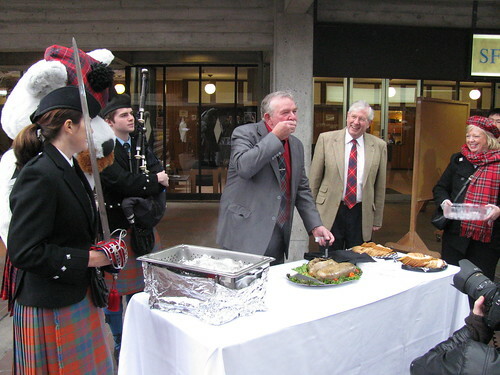 to come as part of the annual Gung Haggis festivities here at SFU. name for each must be submitted! Submissions must be received at ghfc-teams@sfu.ca by midnight on Thursday, January 27th, 2005.
power and hold elections as ordered. Joan Siedl, history curator for Vancouver Museum. Alexander Mackenzie, explorer of Mackenzie River. he was born in Vemont - a yankee! between First Nations and White communities. Canada. Helped to found the Chinese Methodist Church in Vancouver. Helped to teach english to Chinese. Also Todd Wong's great great granduncle, and great great grandfather. H.Y. Louie, which bought IGA franchises in BC, and later London Drugs under son Tong's presidency. Grandson Brandt is currently Chair of SFU's Board of Govenors and nominated to be the next SFU Chancellor. This entry was posted in Main Page, SFU Gung Haggis Fat Choy "Canadian Games" on January 26, 2005 by Todd. party” when he was a student at Simon Fraser University. Robert Burns. And Gung Haggis Fat Choy is a combination of the two. university tour guide, requesting his assistance. “What? 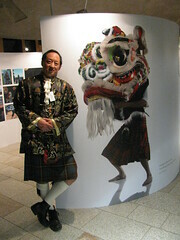 A Chinese guy wearing a kilt? That's strange – that's weird,” he said of his initial reaction. said, while standing on the steps of SFU's Convocation Mall. the two cultures into one celebration – he agreed to wear the kilt. But it wasn't until 1998 that Gung Haggis Fat Choy was truly born. Day traditional treat of haggis. “Gung Haggis Fat Choy is an intersection of the Scottish-Canadian heritage, and the Chinese-Canadian heritage,” Wong said. This year's event is even more special though because Wong is bringing it back to SFU. elements and a dragon-boat race on drylands. see my recollection of the interview with reporter Katie Robinson and phtographer Mario Bartel. This entry was posted in 2005 Gung Haggis Fat Choy dinner, Main Page, SFU Gung Haggis Fat Choy "Canadian Games" on January 24, 2005 by Todd.